Today Im excited to share with you some of the latest significant enhancements to Windows Defender ATP. 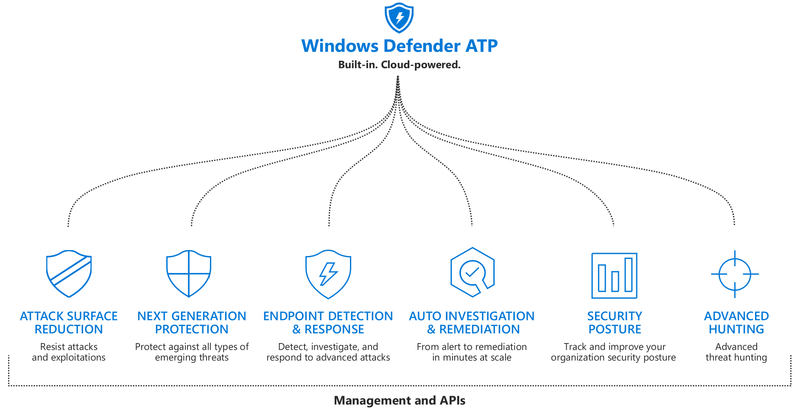 We added new capabilities to each of the pillars of Windows Defender ATPs unified endpoint protection platform: improved attack surface reduction, better-than-ever next-gen protection, more powerful post-breach detection and response, enhanced automation capabilities, more security insights, and expanded threat hunting. These enhancements boost Windows Defender ATP and accrue to the broader Microsoft Threat Protection, an integrated solution for securing identities, endpoints, cloud apps, and infrastructure. These new rules allow enterprises to prevent child processes from being created from Office communication apps (including Outlook) and from Adobe Reader, right at the workstation level. These help eliminate many types of attacks, especially those using macro and vulnerability exploits. We have also added improved customization for exclusions and allow lists, which can work for folders and even individual files. Emergency security intelligence updates are new, super-fast delivery method for protection knowledge. 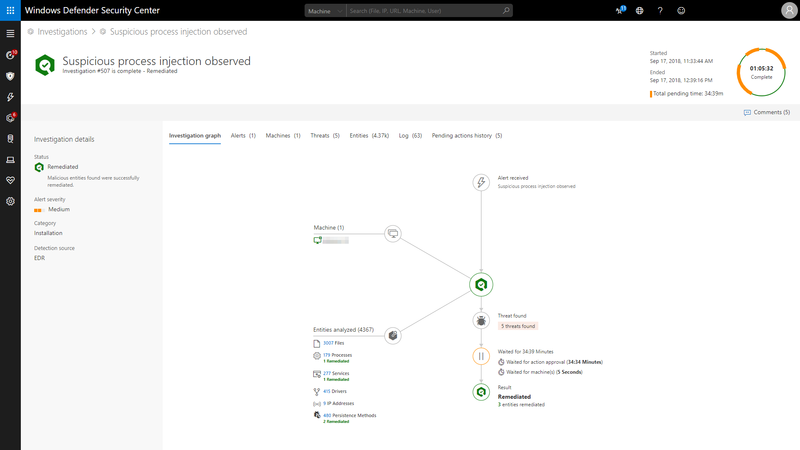 In the event of an outbreak, Windows Defender ATP research team can now issue an emergency request to all cloud-connected enterprise devices to immediately pull dedicated intelligence updates directly from the Windows Defender ATP cloud. This reduces the need for security admins to take action or wait for internal client update infrastructure to catch up, which often takes hours or even longer, depending on configuration. Theres no special configuration for this other than ensuring cloud-delivered protection is enabled on devices. Weve also continued to invest in hardening our platform to make it harder for malicious actors to exploit vulnerabilities and bypass the operating systems built-in security features. Weve done this by putting Windows Defender ATPs antivirus in a dedicated sandbox. Sandboxing makes it significantly more difficult for an attacker to tamper with and exploit the antivirus solution as a means to compromise the device itself. 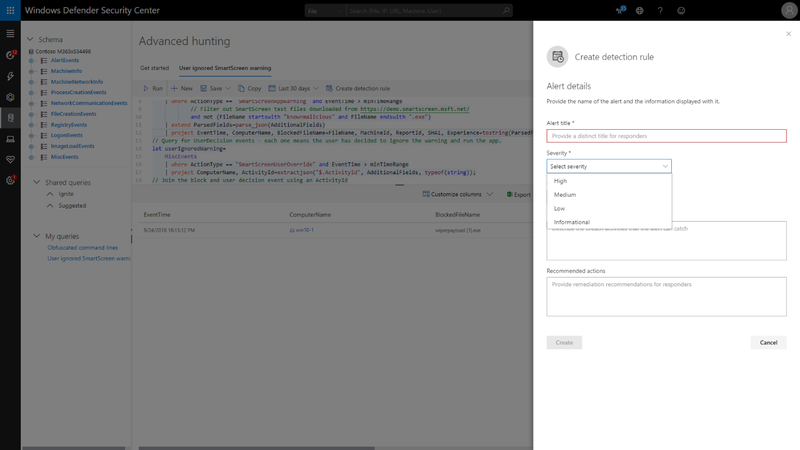 We expanded automation in Windows Defender ATP to automatically investigate and remediate memory-based attacks, also known as fileless threats. We see more and more of these memory-based threats, and while weve had the optics to detect them, security analysts needed special investigation skills to solve them. Windows Defender ATP can now leverage automated memory forensics to incriminate memory regions and perform required in-memory remediation actions. Threat analytics is a set of interactive threat intelligence reports published by our research team as soon as emerging threats and outbreaks are identified. 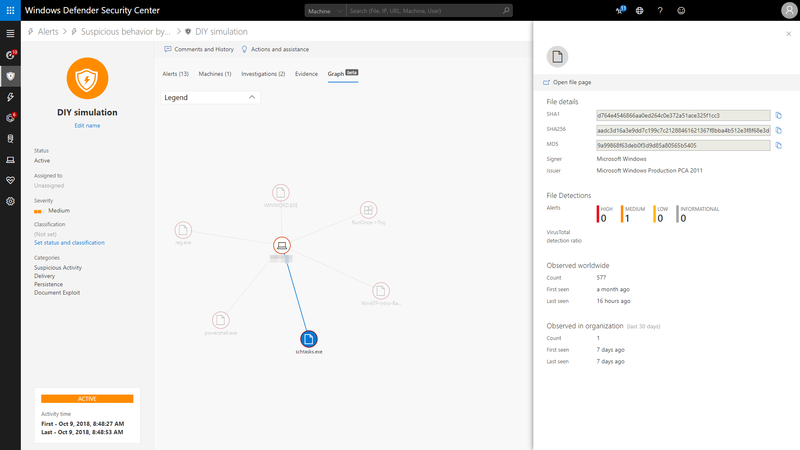 The Threat analytics dashboard provides technical description and data about a threat, and answer the key question, Does WDATP detect this threat?. It also provides recommended actions to contain and prevent specific threats, as well as increase organizational resilience. But we dont stop there. We also provide an assessment of the impact of threats on your environment (Am I hit? ), as well as show a view of how many machines were protected (Were you able to stop this?) and how may are exposed to the threat because they are not up-to-date or are misconfigured (Am I exposed?). Meanwhile, the work to stay ahead of threats doesnt stop. You can count on the Windows Defender ATP team to continue innovating, learning from our own experiences, and partnering with you to empower you to confidently protect, detect, and respond to advanced attacks. The post What’s new in Windows Defender ATP appeared first on Microsoft Secure.